Yorkshire is not a county I know that well, but even in my Cornish backwater I have heard of the famous Bettys tea rooms which first opened its doors in Harrogate in 1919. There are now six branches dotted around Yorkshire. When I knew I was headed to York on a work trip last year, there was one establishment I was determined to visit, no matter what. With only a few minutes to spare before my train departed, I managed to locate the tea rooms, heave a few lingering sighs over the array of delights surrounding me, ask for a Yorkshire curd tart and run. I had heard a lot about Yorkshire curd tart from an expat colleague who was always bemoaning the fact she couldn’t get them down in the South West. After savouring it on the train home, I understood what she had been mithering on about – it really was delicious. I recently had a go at making a chocolate version and although it was very tasty, it didn’t quite have the impact of that first one I tried from Bettys. All of this is a rather long winded way of saying that when Betty’s asked if I’d like to review their Christmas Gugelhupf, I was not going to say no. So whilst I waited for it to be delivered, I had ample opportunity to ponder on what exactly a Gugelhupf was? 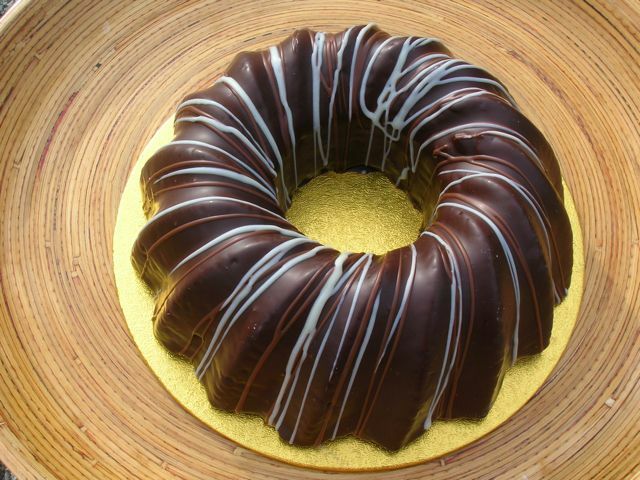 Pronounced google-hoopf, it is the precursor to the American bundt type of cake. Originating from Southern Germany, Vienna, Switzerland and Alsace, the Gugelhupf is a fermented ring cake, dusted with sugar or covered in a chocolate glaze and eaten with a cup of coffee. The story goes that the three kings, travelling to or from Bethlehem, stopped off in Alsace. The residents there were so delighted, that they baked a cake in the shape of the the King’s turbans to honour the visit. Today, it is more common to make Gugelhupfs with baking powder rather than yeast and Bettys is one of these. The cake came well wrapped, in fact within the cardboard box it looked, to all intents and purposes, as though it was wearing a coat of golden chain mail. It was surprisingly heavy for the size (a good sign in my opinion) and when I unwrapped it, I realised why, it weighs in at 730g. After admiring its luxurious elegance and inhaling the heady chocolatey aroma, the first thing I did was look at the ingredients. I am always concerned that shop bought cakes will have far too many ingredients of which I’m likely to disapprove. I needn’t have worried. Betty’s is a high quality brand and as such doesn’t use junk ingredients. In supporting my case, I happily noted that butter was the first ingredient listed. Ingredients: butter, sugar, egg, flour, hazelnuts, dark chocolate (65% cocoa solids), invert sugar syrup, maize starch, vanilla, raising agents, milk chocolate (38% cocoa solids) and white chocolate (36% cocoa butter). My mother, who is extremely fussy about cake in general and highly suspicious of bought cake in particular was very impressed. So all in all, I can only say that this cake scored very highly. Now, I really think it’s time I acquired a bundt mould! If you cant get to a Bettys tea shop, you can take a look at Bettys online shop where you can buy this gugelhupf for £14.95 and any number of other scrumptious delights. Last order dates for Christmas are 19th December for UK mainland, 5 December for EU and 28th November for the rest of the world, which doesn’t give a lot of time. Betty’s have kindly agreed to give one of my readers a luxury Christmas Gugelhopf too. To be in with a chance of winning, please fill in the Rafflecopter below. You will need to leave a comment on this post which then gives you additional chances to enter if you so wish. Rafflecopter will pick a winner at random from the entries received. If you are commenting anonymously, please give me some way of identifying you as I will be verifying the validity of entries. Any automated entries will be disqualified. This giveaway is only open to those with a UK postal address. Because of the Christmas rush, winners will need to respond within 2 days of being contacted. Failure to do this will result in another winner being picked. We no longer live near a Betty’s and I rather miss it. When we lived near Ilkley I used to treat myself to coffee and cake every so often, especially at this time of year when they had their Christmas treats on sale. You’re right about Yorkshire curd tarts, they’re delicious. Anything with chocolate does it for me. I wish I lived near ‘Betty’s’!! I’d love to try a chocolate gugelhupf! After having a look at the chocolate and hazelnut Gugelhupf I can honestly say I can’t think of a better flavour! I’d love to try it. I think we might have to give the Christmas desserts at the supermarket a miss and order something proper! I would love the chocolate one yum! I would love to try the chocolate one. That’s a wonderful looking cake! I particularly like the crisp chocolate shell. A Choccie Gugelhupf would be a delicious treat! All the family would enjoy a chocolate one! Chocolate and hazelnut is a hard flavour to beat so that would be my choice. The chocolate one sounds perfect to me! I’d love to try the chocolate one! The one which is covered in chocolate please. The Christmas one sounds utterly scrummy! Meeeeeeeeep! i’d like a chocolate one, cuppa tea, close my eyes and imagine i was in Betty’s. After reading your comments and seeing the photos it has to be a chocolate one! It would have to be chocolate. Dark chocolate will do just fine thanks! Chocolate,nuts,Christmas = heaven for me. chocolate and hazelnut please. The world is so much better when covered in chocolate! Ooooh chocolate would be fantastic! Chocolate sounds perfect, what a centre piece on the table at Christmas. The chocolate and hazelnut sounds amazing! Anything containing chocolate is good enough for me im a chocoholic! Love the idea of chocolate AND hazelnut (my favourite flavour) but I also like a lemon and poppy seed Gugelhupf too! – NB the ecapture thing on the blog is awful, I had 8 attempts then. 🙁 each was correct. Anything chocolate for me, pleeeease!!!! I’d love to try a chocolate, caramel and pecan one. Plain chocolate, whisky & ginger would be a delicious flavour. Hmmm…Of course, chocolate, but I would rather like apple, too. It would definitely have to be the Chocolate one! Chocolate and hazelnut, very Italian. Wow! A different kugelhuph from the one I just baked! … You know? With that gorgeous chocolate coating, it reminded me of the little Lebkuchen cookie/cakes that we bought when we went to the Nurnberg Weinachtsmarkt … so spicy and chocolatey and good! Wish I lived in the UK so I could take a chance on receiving one to ‘taste test’! The Chocolate & Hazlenut flavour sounds lovely. Chocolate & Hazelnut for me, please! What flavour Gugelhopf would you like to try? – I’d love to try a Chocolate & Hazelnut one. P.s. I love buying my Grandma things from Betty’s, as her name is Betty so she’s got biscuit tins etc. with her name on them!!! It has to be chocolate for me! Chocolate and hazelnut – yummy! I think a Chocolate Orange Gugelhopf would be lovely. Defintely chocolate & I’m so lucky to live only 30 miles away from Betty’s but when you can’t drive there it’s hell! I’d love to try this, looks delicious!! The chocolate one is actually making my mouth water!!! Would love to try that one!!! The a chocolate and hazelnut one sounds marvelous!! Looks like the chocolate one gets my vote too. Chocolate every time for me!!! The chocolate version sounds delicious. Chocolate – These look amazing! The chocolate and hazelnut Gugelhupf, coated in dark chocolate sounds heavenly, although I would love to suggest they try making a chocolate and mint one!! I would love to try the chocolate gugelhupf, it sounds so delicious !! I have never heard of Gugelhupf but I would love to try it. Looks delicious. I’d love to try a yummy chocolate one! choc n hazelnut – v christmassy! If im honest I had never come across this product although I would love to try. I think the chocolate looks lovely. I’d love the Chocolate and Hazelnut Cake……would be perfect for my 50th Birthday on Christmas Day! Chocolate and hazelnut sounds really yummy. Bettys is fantastic. i have never even heard of these before, the christmas one looks absolutely amazing, and a nice change from the usual christmas cake that gets left uneaten til march!!! Chocolate with hazelnut makes the perfect combination! I would like to try one flavoured with apple, cinnamon & ginger, I think that would be really Christmassy. I would love a Coffee and Hazelnut one but could eat the chocolate one any day!